Yakima, Wash. – November 29, 2016 – Today, Yakima County announced it is the recipient of a $75,000 grant from the Open Rivers Fund, a program of Resources Legacy Fund (RLF), supported by a 50th anniversary grant from the William and Flora Hewlett Foundation. 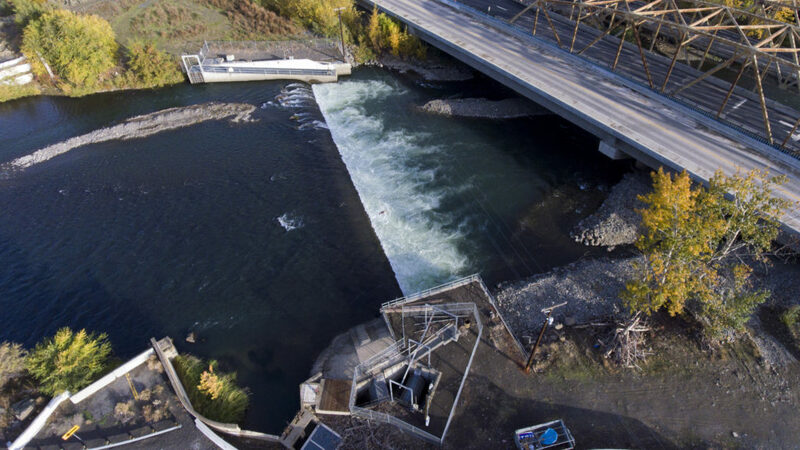 The funds will assist with the removal of the Nelson Dam, an 8-foot high irrigation diversion dam owned by the City of Yakima on the Naches River. The Naches is an important salmon bearing river that is the largest tributary of the Yakima River. Sediment has built up for several miles behind Nelson Dam, exacerbating flooding in the area upstream from businesses, homes and roads. Removing Nelson Dam is an essential part of a plan to greatly reduce flood risks and improve public safety during floods. Once removed, the dam will be replaced with a roughened channel that allows the City to divert irrigation water at lower operations and maintenance costs. Fish will be able to freely pass upstream and downstream at all water levels, something the existing Nelson Dam does not accommodate. Reestablishing sediment transport will improve about 6 miles of floodplain and river habitat upstream and downstream of the dam in an area that is important for fishery spawning and rearing. This effort is supported by a broad coalition including the City of Yakima, Yakima County, the Yakama Nation, American Rivers, the Washington Department of Fish and Wildlife, the Washington Department of Ecology, the Bureau of Reclamation, North Yakima Conservation District, National Marine Fisheries (NOAA) the Yakima Tributary and Habitat Project, the Yakima Basin Fish and Wildlife Recovery board, and various irrigation districts. Floodplains by Design, a collaboration between the Department of Ecology, The Nature Conservancy and the Puget Sound Partnership to provide funding for integrated floodplain management projects, has awarded grants for restoration work, property acquisition and levee setbacks surrounding the dam. The removal of the Nelson Dam is part of the Yakima Basin Integrated Plan, which is supported by all relevant tribal, federal, state and local government agencies, NGOs and other organizations. Resources Legacy Fund’s Open Rivers Fund will provide $75,000 to support project design and permitting that meets fishery and conservation goals. The effort will receive an additional $25,000 for outreach and communications in order to engage stakeholders, build public awareness and promote this approach to river restoration. The Open Rivers Fund is the largest philanthropic fund dedicated to dam removal and river restoration. It will provide resources to communities that are working to get dam removal and infrastructure modernization projects off the ground and will reduce cost barriers for these projects. Read a fact sheet on the Nelson Dam removal project. Read the Open Rivers Fund announcement press release.